For as much as we use our hands, it is surprising that they are not injured more frequently. Sports-related metacarpal fractures most commonly occur during participation in contact sports, such as football, rugby, or basketball, in which the hands are unprotected. A direct fall onto the hand (FOOSH injury) while cycling, running, or skiing may also result in a fracture. Displaced fourth and fifth metacarpal fractures, anteroposterior view. Displaced fourth and fifth metacarpal fractures, lateral view. 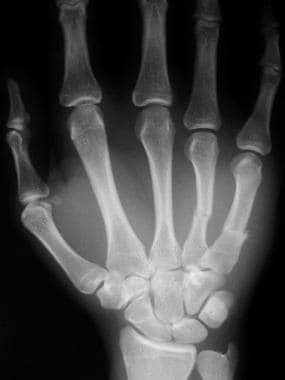 Fourth and fifth metacarpal fractures, oblique view. For patient education resources, see the Fractures and Broken Bones Center, as well as Boxer's Fracture, Broken Hand, Cast Care, Finger Dislocation, Finger Injuries, and Human Bites. 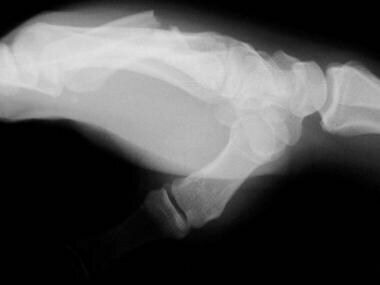 Metacarpal and phalangeal fractures are the most common fractures of the upper extremity. They account for approximately 10% of all orthopedic fractures. [2, 3] Most occur in young adults, usually as a result of direct blunt trauma, axial loading, or throwing a punch during an altercation. The thumb and small finger are the most frequently injured. The finger metacarpals describe a gentle arch in both the axial and coronal planes. Each bone is relatively straight along its dorsal cortex and concave along the palmar surface. The carpometacarpal (CMC) joints consist of 5 metacarpal bases that articulate with the trapezoid, trapezium, capitate, and hamate. Articular congruity of the joint surfaces, in combination with the strong interosseous and extrinsic palmar and dorsal ligaments, provides stability to the CMC joint. The CMC joints of the index and long fingers are essentially fixed, whereas those of the ring and small fingers enjoy 20-30° of motion in flexion-extension. The thumb is extremely mobile at the CMC joint. The anatomic relationships described above maintain proper rotational alignment of the fingers and allow for the smooth production of power grip and the ability to clench the fist, functions that are required in many sports. The high mobility of the thumb enables both pinching (squeezing small equipment or objects between the thumb and the forefinger) and grasping of large objects. 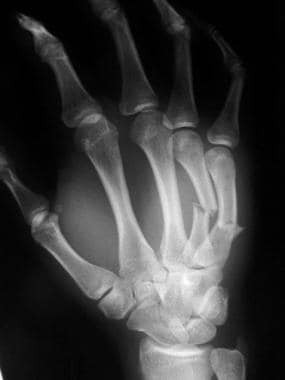 An analogous situation exists with the reverse Bennett fracture of the small-finger metacarpal. Intermetacarpal ligaments stabilize the radial fragment. The hypothenar and the flexor and extensor carpi ulnaris muscles pull the remaining metacarpal proximally and dorsally. Lambotte A. The Classic. Contribution to conservative surgery of the injured hand. By Dr. A. Lambotte. 1928. Clin Orthop Relat Res. 1987 Jan. 214:4-6. [Medline]. Stern PJ. Fractures of the metacarpals and phalanges. Green DP, Hotchkiss RN, Pederson WC, eds. Green’s Operative Hand Surgery. 4th ed. New York, NY: Churchill Livingstone; 1999. 711-71. EMMETT JE, BRECK LW. A review and analysis of 11,000 fractures seen in a private practice of orthopaedic surgery, 1937-1956. J Bone Joint Surg Am. 1958 Oct. 40-A(5):1169-75. [Medline]. [Full Text]. Gaheer RS, Ferdinand RD. Fracture dislocation of carpometacarpal joints: a missed injury. Orthopedics. 2011 May 18. 34(5):399. [Medline]. Brownlie C, Anderson D. Bennett fracture dislocation - review and management. Aust Fam Physician. 2011 Jun. 40(6):394-6. [Medline]. Weckesser EC. Rotational osteotomy of the metacarpal for overlapping fingers. J Bone Joint Surg Am. 1965 Jun. 47:751-6. [Medline]. [Full Text]. Yoshida R, Shah MA, Patterson RM, Buford WL Jr, Knighten J, Viegas SF. Anatomy and pathomechanics of ring and small finger carpometacarpal joint injuries. J Hand Surg [Am]. 2003 Nov. 28(6):1035-43. [Medline]. Lane CS. Detecting occult fractures of the metacarpal head: the Brewerton view. J Hand Surg [Am]. 1977 Mar. 2(2):131-3. [Medline]. Gedda KO, Moberg E. Open reduction and osteosynthesis of the so-called Bennett's fracture in the carpo-metacarpal joint of the thumb. Acta Orthop Scand. 1953. 22(3):249-57. [Medline]. Livesley PJ. The conservative management of Bennett's fracture-dislocation: a 26-year follow-up. J Hand Surg [Br]. 1990 Aug. 15(3):291-4. [Medline]. Chong AK, Chew WY. An isolated ring finger metacarpal shaft fracture?--beware an associated little finger carpometacarpal joint dislocation. J Hand Surg [Br]. 2004 Dec. 29(6):629-31. [Medline]. Pomares G, Strugarek-Lecoanet C, Dap F, Dautel G. Bennett fracture: Arthroscopically assisted percutaneous screw fixation versus open surgery: Functional and radiological outcomes. Orthop Traumatol Surg Res. 2016 May. 102 (3):357-61. [Medline]. Bora FW Jr, Didizian NH. The treatment of injuries to the carpometacarpal joint of the little finger. J Bone Joint Surg Am. 1974 Oct. 56(7):1459-63. [Medline]. [Full Text]. Moon SJ, Yang JW, Roh SY, Lee DC, Kim JS. Comparison between Intramedullary Nailing and Percutaneous K-Wire Fixation for Fractures in the Distal Third of the Metacarpal Bone. Arch Plast Surg. 2014 Nov. 41(6):768-72. [Medline]. [Full Text]. Burton RI, Eaton RG. Common hand injuries in the athlete. Orthop Clin North Am. 1973 Jul. 4(3):809-38. [Medline]. Burkhalter WE. Closed treatment of hand fractures. J Hand Surg [Am]. 1989 Mar. 14(2 pt 2):390-3. [Medline]. Jahss SA. Fractures of the metacarpals: a new method of reduction and immobilization. J Bone Joint Surg Am. 1938. 20:178-86. [Full Text]. Ker HR. Dislocation of the fifth carpometacarpal joint. J Bone Joint Surg Br. 1955 May. 37-B(2):254-6. [Medline]. [Full Text]. Fourth and fifth metacarpal fractures after intramedullary pinning, anteroposterior view. Disclosure: Nothing received, but have long-term ownership of public equities from Johnson & Johnson. for: Johnson & Johnson.